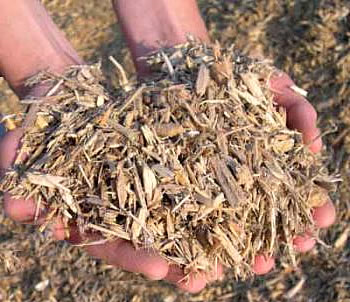 Engineered wood fiber is an organic surfacing for landscaping, playgrounds, and other settings. When engineered wood fiber is used as a playground surfacing, it is appropriate for children of any age (assuming that the depth of the surfacing is sufficient). Generally, however, engineered wood fiber is best for smaller children, ages 2 – 5 years. This is because engineered wood fiber is composed of very small pieces that do not have any sharp edges, as occasionally seen in standard wood chips. Engineered wood fiber is also compliant with the Americans with Disabilities Act (ADA). This is because it compacts down, making it accessible to wheelchairs. Other surfaces like wood chips, pea gravel, sand, rubber mulch are not considered ADA compliant because wheelchair wheels and crutches cannot gain traction in them. For playground use, there are two other big issues: quality and depth. We’ve got you covered on both counts. Our engineered wood fiber is certified by the International Playground Equipment Manufacturers Association (IPEMA). Another organization, ASTM International, certifies engineered wood fiber for impact attenuation (ASTM F1292), so that it is free of nails, staples and hazardous metals such as lead, mercury and arsenic, and to ensure that it is ground properly so that the product will knit together to meet federal accessibility laws (F2075 test method for engineered wood fiber). Our suppliers use their own test equipment to perform testing on the engineered wood fiber in a variety of temperatures and weather conditions. If you’re using fiber on a playground, your play equipment needs a minimum depth of 9 inches of engineered wood fiber underneath it and in the equipment’s use zone (the area six feet around the structure in all directions). One popular method of installing engineered wood fiber is to distribute it on top of a layer of landscaping fabric that has been placed over 3-4 inches of gravel. This creates a natural drainage system that flushes out rain water and can extend the life of the engineered wood fiber. If you have any questions about engineered wood fiber, phone us toll free at (877) 840-0707.